A covert agent asked to train a prodigy telepath discovers he must first keep the boy and his mother alive in a gleaming city full of danger. An injured agent on the galactic capital planet must evade whoever is killing off his covert interrogations unit and make an impossible choice-save his own skin, or save an innocent woman and her prodigy son. Can he discover who is subverting the mission of the Citizen Protection Service, before they fulfill their dark plans? 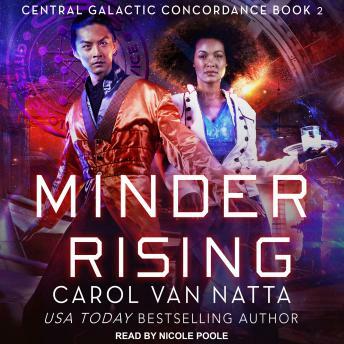 A millennium into the future, the Citizen Protection Service tests all children for minder talents, and recruits the best.Injured agent Lieren Sòng is recovering from a near-fatal crash in Spires, the gleaming capital city of the galaxy. He should be preparing to return to interrogating criminals for the Citizen Protection Service, but he's made unexpected friends with a woman and her son. The boy has strong telepathic talents similar to Lieren's, and his attractive mother makes Lieren long for the stability of family. Imara Sesay works hard as a road crew chief in Spires and part-time bartender to provide for her son Derrit. For him, she even breaks her ironclad rule never to get close to a customer, when she trusts Lieren to teach her son how to control his growing telepathic talents. However, new fatalities in his covert unit make Lieren suspect he isn't a lucky survivor, he's a loose end. He should pull away from Imara and Derrit to keep them safe. But when the local CPS Testing Center shows a more than usual interest in the boy, Lieren must make an impossible choice-protect the boy, or run for his own life. Can he stay alive long enough to save Imara and her prodigy son?